The Eight Jings are: peng, ward off; lu, roll back; ji, press; an, push; ca, pluck; lie, splitting/rend; zhou, elbow stroke; and kao, shoulder stroke. The first four Jings are directional and recognized as the four main energies protecting the directions of North, South, East, and West. The “Song of Four Directions,” is a concept that reflects the principle of the four main jings. These eight forces/energies or Jing, all combine with the following five active movements which are step forward, retreat backward, look left, and gaze right, as well as hold the center. Combined together the Eight Jings and the five active movements are called the 13 postures. They are the concealment of possible strategic initiatives and conceptual realism’s dealing with absorption and expansion. These eight powers act as a multiple value function and conceal energy techniques and theories in harmonic progression. This conjugates the principle theorems of yin soft energy and yang hard energy into a body of energetic density. 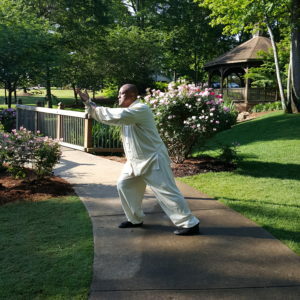 In turn, it agitates the capacity to store energy within every movement, making tai chi chuan the containment of energy in motion. This containment is in the posture and alignment and the gathering of the principles, while linking them into a shape in which they can be expressed. The focus will be as clear as its opposition, meaning that the movement will reflect both the imminently real or probable, and the imaginable. It will be direct yet the concept will exist in a state of fluidity. However, the motion isn’t primarily external, it generates internally and resonates and is expressed externally as a type of conceptual realism. Within the study of the governing concepts of the Eight Jings, there are three more jings (ting jing, hua jing , and fa jing}, which are very important in the learning and development of Push Hands. Jing translates to mean force/energy, and it’s the expressive energy that is embedded in the mechanics of proper technical skills and understanding of the principles and concepts as they should be performed. All movements can be expressed within a certain concept, at will, with jing power. The combination of “yi,” mind intention, and “shen,” spirit/mind, and “chi,” vital energy, should permeate and gather internally and be felt and seen externally. “Ting Jing” teaches the skill of listening not merely with the ears. However, your entire skin must come alive and be elevated to a heightened state of sensitivity. “Hua Jing” teaches the skills of redirecting/neutralizing the opponents force, and “Fa Jing” teaches the skills of issuing energy. A reasonable amount of time should be given to developing a relationship with each of these concepts to assure proper development. directed by the waist, then manifested in the hands/fingers. 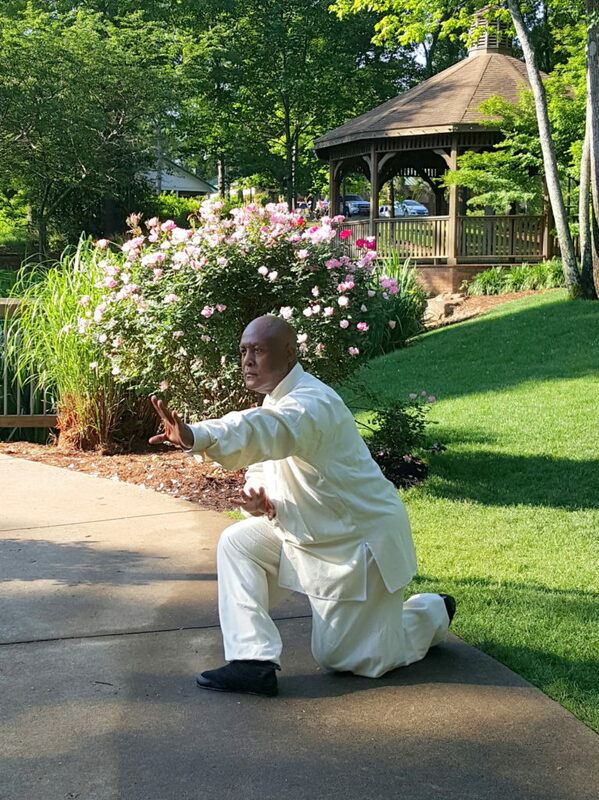 In the studying tai chi chuan, these concepts should be studied and expressed in all thoughts /movements. The Eight Jings are visually simplistic wrapped in intricate complexity. Becoming acquainted with concepts such as Ting Jing, Hua Jing, and Fa Jing will increase your ability to execute the concepts within the eight forces. However, you should spend time with understanding the concepts that are so deep and rich within the soil/strata of yin and yang and are infinite in the combinations that may be expressed. Limitations exist upon the individual’s lack of understanding of the Eight Jings. Having a better understanding of the three jings, Ting, Hua and Fa, will elevate the concepts of join, stick, and follow. Join reminds and teaches us to forget about the self and to join as one with the opponent in all of his moves. Stick brings to mind the concept of becoming one …no separation. It reminds us that there should be no separation between us and the opponent. Follow teaches us and reminds us to stay in the moment and adapt every minute motion that is executed by the opponent, then change it immediately to shadow the opponent. Great blog, Sifu. This really gives me insight into jings, which I have to admit always seemed enigmatic. If I understand correctly; Ting Jing, Hua Jing, and Fa Jing, along with concepts of join, stick and follow are the foundations of push hands. These concepts are also necessary to strengthen understanding of any one of the Eight Jings. I am having problems understanding the difference between “join”, “stick” and “follow”. These concepts seem like they would be the same, especially joining and sticking. I would be interested in hearing opinions on how these concepts differ from my fellow students. Am I Body, or am I Mind? 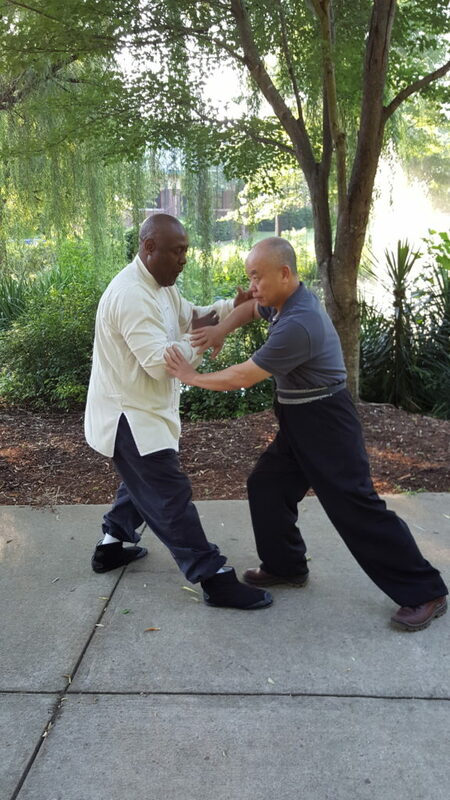 Lam Tang has offered martial arts & self-defense training to students from Lexington, West Columbia, Irmo, Blythewood, Cayce, and Columbia for over 30 years. Established in 1985, we are proud to be South Carolina's first Kung Fu and Tai Chi school. Call 803.606.5672 today for more information!